Weighty Matters: French-Fried Hot Dogs? I need a softball post to get back to blogging and thanks to my favourite blogging anaesthetist Joe, I've got one. 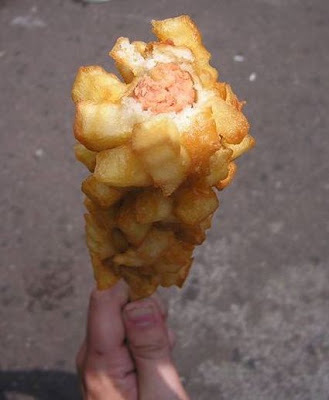 Introducing this year's first Frankenfood, straight from South Korea - the french-fried hot dog. I imagine that whatever evil technology was used to fuse the fries to the dogs will soon be used to make french-fried lots of other stuff. Hope you all had great holidays - look for some more figuratively meaty posts later this week.